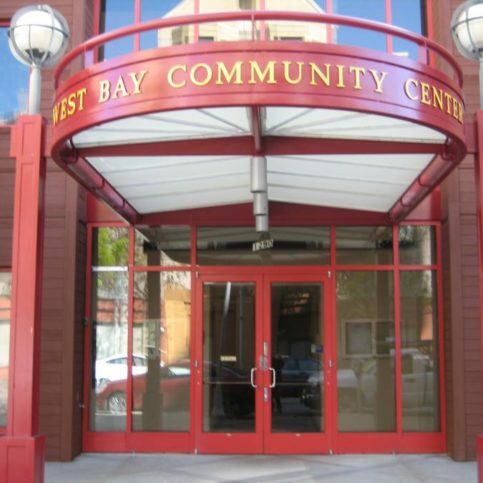 Bay Area residents are fortunate to live in an area renowned for beautiful, temperate weather year-round. Many homeowners and business owners take advantage of the moderate climate by integrating indoor and outdoor spaces, and having patios that double as outdoor living rooms on nice days throughout the year. But patios can become hot and less inviting without ample shade, especially on warmer days. That’s where local Alameda County patio cover companies come into play. 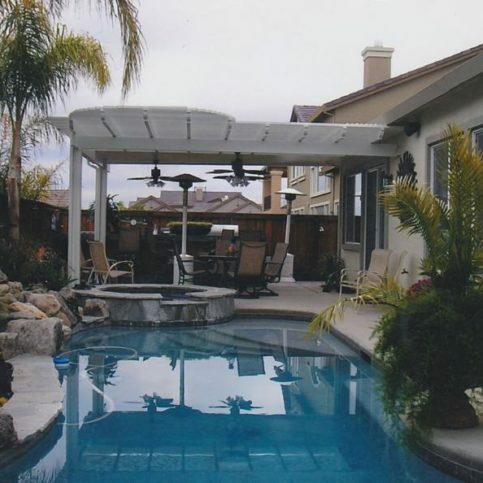 Patio cover shops and installers in Oakland, Fremont, Hayward, Berkeley, San Leandro, Alameda, Union City, Pleasanton, Newark and Dublin and the rest of Alameda County offer a large selection of outdoor patio covers from permanent options like pergolas and permanent patio covers to retractable patio covers and movable patio covers that offer shade in specific areas. The articles below will tell you more about patio cover options available to you and discuss the ways you can hire a patio cover company with confidence. Read on for more information about the types of patio covers you may find in Alameda County patio cover stores, helpful tips for choosing the best products for you, sample interview questions, and more information about hiring good patio cover contractors in San Leandro, Berkeley, Hayward, Fremont and Oakland and your city. Patio shade covers offer several benefits to homeowners. Patio covers make your outdoor patios more comfortable and livable, increasing your home’s square footage and giving you more room in which to live and entertain. Patio coverings and patio shades turn sun-baked patio spaces into cool, shaded retreats where kids and pets can play, you can cook and entertain, and the whole family can relax outside together. Patio shade covers block harmful UV rays that can cause cancer and sunburns. Patio coverings that shade the hottest side of your house (usually the south-facing wall) can keep your home cooler inside, lowering cooling bills and keeping your house more temperate during the summer. Patio shades give you control over how much sun you want your patio to receive. Adjustable patio shading, movable patio covers and lattice or pergola-type sun shades (especially those with adjustable louvers) allow you to specify where and how much sun and shade your patio gets. Solid patio covers even offer some degree of protection from light rains during the winter months. High-quality patio coverings can add resale value to your home. 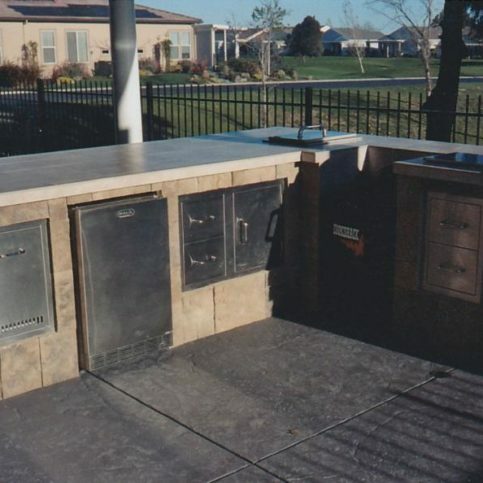 They are an affordable, easy home improvement project that can increase the usable space of existing homes and create lovely outdoor living areas that can entice buyers and add a unique quality to your home. What Kind of Patio Covering Is Best for Your Needs? The choices for patio covers are practically unlimited, with a wide variety of materials, sizes, finishes, colors and special features that come in a range of prices to fit almost any budget. Metal patio covers such as aluminum and corrugated steel patio covers add a permanent, solid structure above your patio. These are often fire-resistant, so may be good options in fire-prone areas or locations where permanent structures are required to be fire-safe. Metal patio covers are relatively simple to install, so they may be good DIY options or go up quicker than other types of patio covers if you’re in a hurry. They are available in a variety of colors, sizes and styles to fit almost any space. Metal patio covers are hardy and durable, and they resist harsh outdoor conditions and insect activity that can deteriorate patio coverings made of other materials. Wood patio covers are popular choices because they can be inexpensive and attractive, and they can be painted or stained to match your existing outdoor environment. Wood patio covers can be made from maple, cedar, bamboo, oak, pine, and other types of wood both native, exotic and eco-friendly. Wood patio coverings may include lattice patio covers, pergolas, and other popular choices. Vinyl patio covers are modified plastic patio coverings that can look similar to wood. However, they require less maintenance and usually last much longer than wood structures since they require no painting, refinishing or sanding and are impervious to insect activity and weather. They can be less expensive than metal patio covers, yet have a similar life span. Vinyl patio coverings are usually easy to assemble and affordable. Recycled vinyl patio covering options are available for customers who are eco-conscious. Fabric patio covers include patio covers with shade covers made of canvas, nylon, sun-resistant fabrics and other fabric-based materials. Fabric patio shades may be temporary or have permanent bases that attach to canvas sails, umbrellas, rollout shades or awnings that block the sun and light rain using canvas or another tightly-woven shade cloth. Pergola-style patio covers are popular patio shade options. They are permanent structures, usually made out of wood, aluminum or vinyl faux wood that may be partially-supported by a building or freestanding and anchored to the ground with thick posts that support a patio cover top made of a few cross-wise beams and many long-wise beams that are slotted to allow for some sin to get through while still providing ample shade and protection. Pergolas may be covered with ivy, wisteria or other climbing plants for visual appeal and even more protection from the sun. 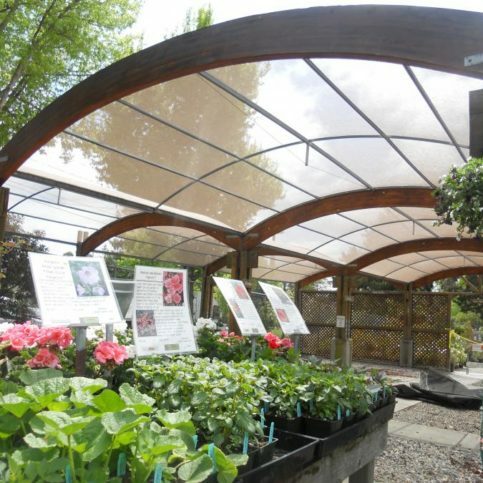 This gives more shade during the hotter summer months when the plants have full foliage, but can allow in more sun and warmth in the winter months when the plants are dormant. Lattice and louvered patio coverings are traditionally made of wood or metal strips that are equally spaced to allow for filtered sunlight to pass through only certain areas while shading the other areas. These patio shades with louvers, or slats, can be a popular choice for patio covers because they allow some sun to filter through while still providing a high degree of sun protection. Louvered patio covers may have fixed louvers or adjustable louvers that can be moved to provide different degrees of shade. Why Trust Diamond Certified Patio Cover Companies Rated Highest in Quality? Dan Phippen is owner of Delta Pacific Builders Inc, a Diamond Certified company. He can be reached at (925) 201-6391 or by email. BETHEL ISLAND — When asked about his professional philosophy, Dan Phippen cites the slogan of his company, Delta Pacific Builders Inc: “Quality from start to finish.” “I take pride in providing quality experiences for my customers, from the time I introduce myself until the follow up after the job,” he says. However, while this slogan sums up Dan’s approach to running his business, it can also be interpreted as a defining theme for his 43-year career, which has been characterized by an enduring desire for excellence. Newly transplanted in the Bay Area, Dan picked up where he’d left off and went to work for Bel Aire Engineering in Hayward, where he became acquainted with new aspects of his trade. “I really enjoyed working for Bel Aire because it gave me the opportunity to do things that not many companies were doing at the time, like working with aluminum patio covers and awnings,” he says. In 1981, just a few years after arriving in the Bay Area, Dan acquired his California contractor’s license and founded Delta Pacific Builders. Outside of work, Dan spends much of his time out on the water. “The Delta is one of the main reasons I moved out here,” he says. “I used to fish in the professional bass tournament circuit, so when I found out the Delta was here, I gravitated to it like a duck to water.” Dan also enjoys keeping up with his two grown children: Danny, who works alongside him at Delta Pacific Builders (“I enjoy working with my son, although it’s probably more enjoyable for me than it is for him,” he laughs), and Lynn Marie, who lives in Pennsylvania. A: When I was 18 years old, I saw Pink Floyd play at Rosecroft Raceway in Maryland. A: I’ve always been a person who lives in the present. Time travel doesn’t interest me at all. A: A pie baking in the oven. A: Bacon and eggs over easy. A: I don’t know if you would call it toy, but I had my own .22 when I was 10 years old. My family had 100,000 acres of property that backed up to 100,000 acres of government land, and we would go out shooting almost every day. Acme Sunshades Enterprise builds and installs awnings with custom graphics for its commercial clients. 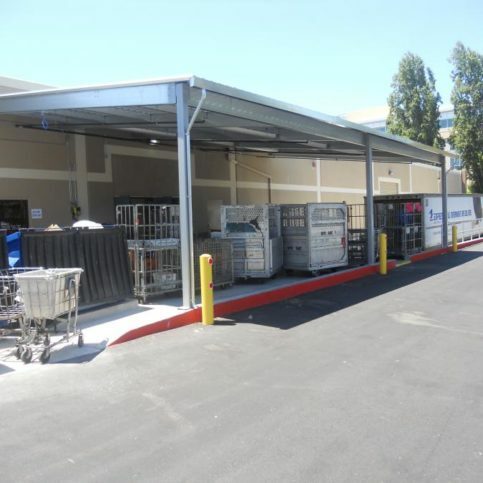 Acme Sunshades Enterprise installed this metal canopy at USPSÛªs loading dock in Sunnyvale. 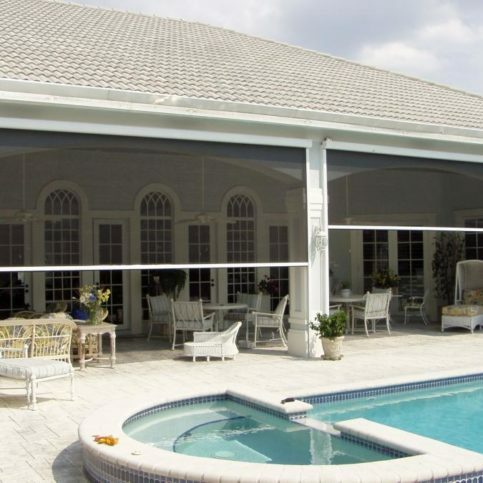 Retractable awnings with graphics can protect glass conservatories and sunrooms. 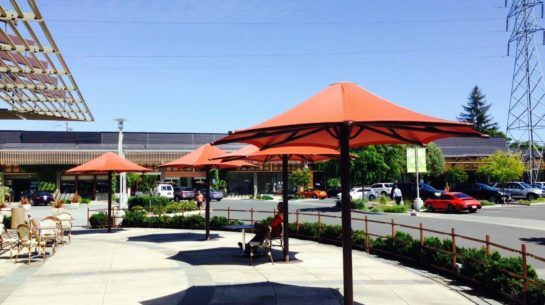 Acme Sunshades Enterprise recovered these umbrellas at Pacheco Plaza in Novato. 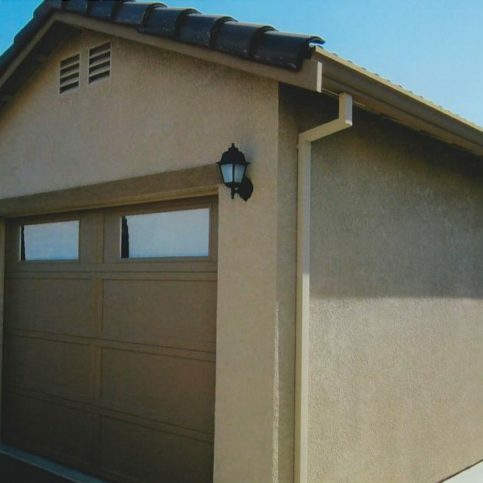 Delta Pacific Builders built this one-car garage for a homeowner in Brentwood. 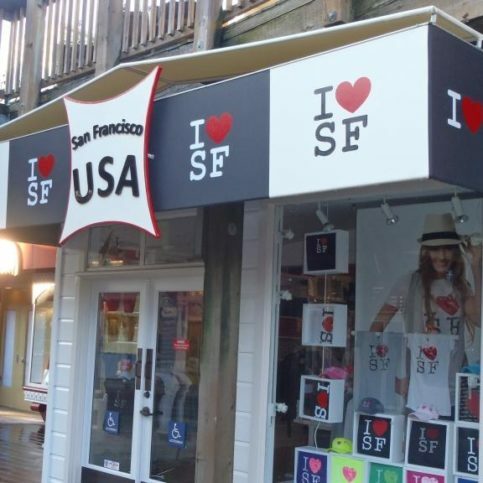 Acme Sunshades Enterprise installed these spear head fixed awnings in Alameda. Delta Pacific Builders built this free-standing trellis. Acme Sunshades Enterprise installed these mesh shade cover arrays in Berkeley. This standalone retractable pergola protects against the sun’s glare. 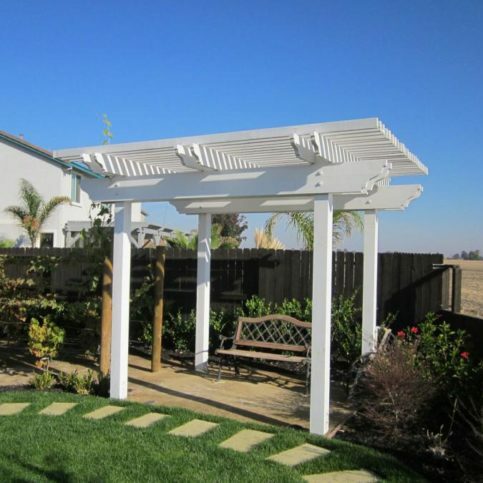 Delta Pacific Builders built this free-standing shade trellis over a Trex composite deck. 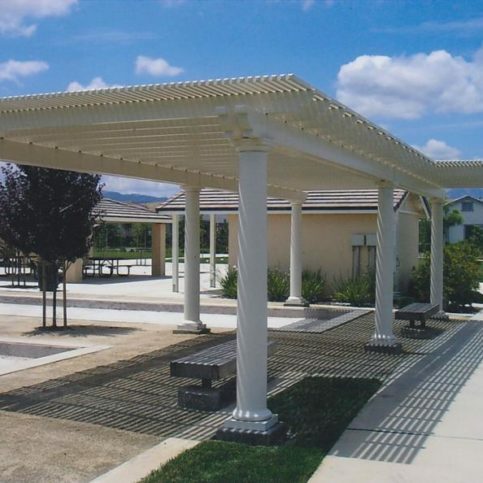 This lattice shade cover with Roman pillars was created adjacent to a bocce ball court. 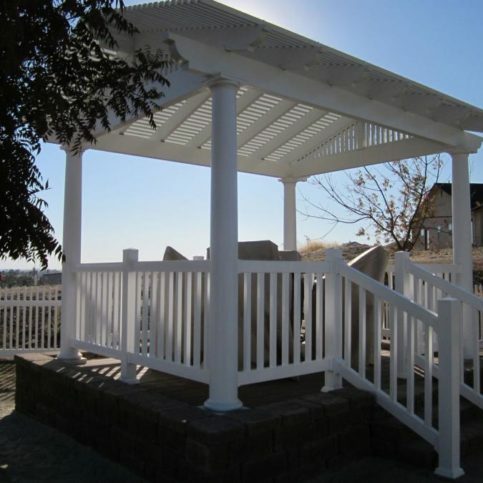 This free-standing lattice cover features Roman-style columns. Delta Pacific Builders used maintenance-free, powder-coated steel to build this motorhome cover. 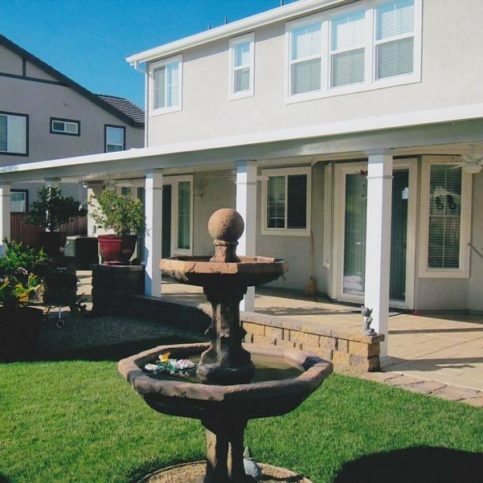 Delta Pacific Builders built this solid patio cover with Roman columns. 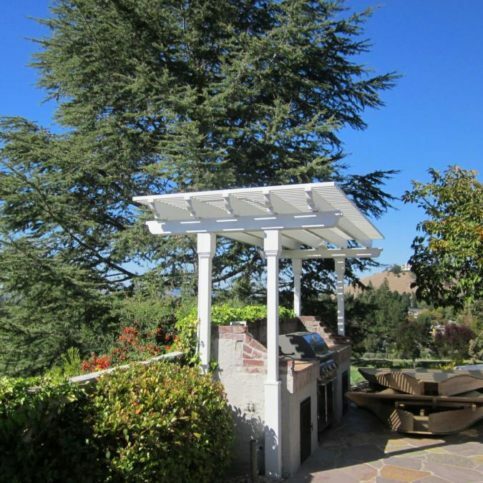 Delta Pacific Builders built this combination solid and lattice patio cover in Brentwood. Acme Sunshades Enterprise installed this freestanding retractable awning with a built-in heater. Delta Pacific Builders installed a paver walkway and constructed this elevated deck with an aluminum A-frame patio cover. 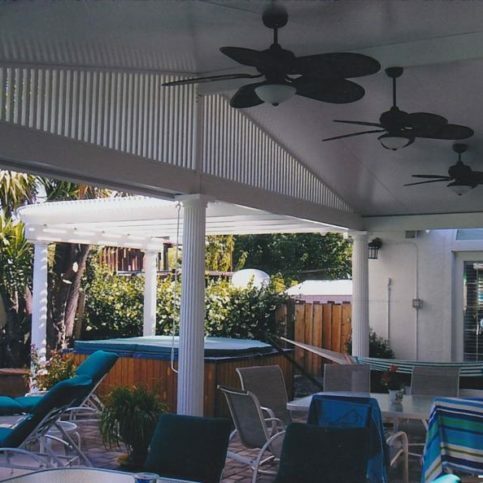 Delta Pacific Builders built this tri-level patio cover for a home in Discovery Bay. Delta Pacific Builders built this combination lattice cover with an A-frame in Brentwood. 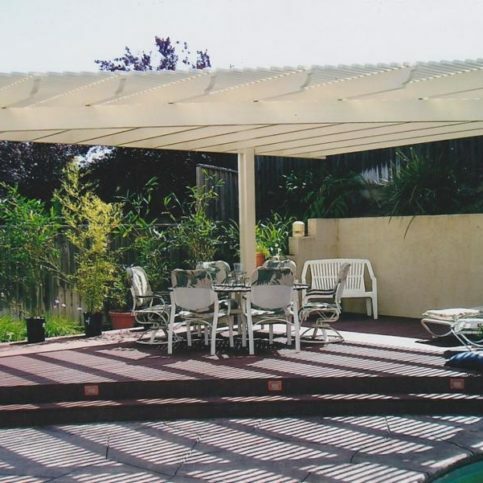 Delta Pacific Builders built this free-standing lattice patio cover. This solid patio cover features Roman-style columns. 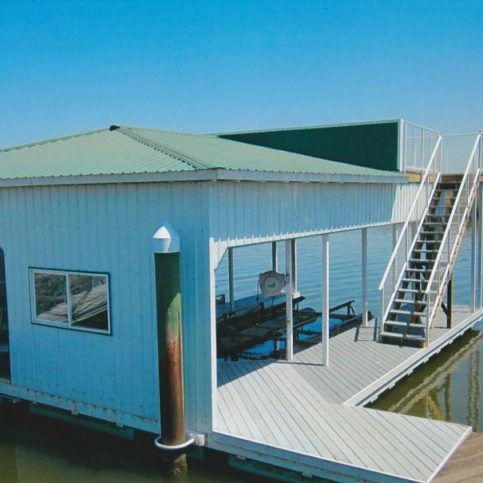 Delta Pacific Builders built this deck enclosure on Bethel Island. This solid patio cover features Roman columns. This carport in Oakland is made of Sunbrella fabrics. 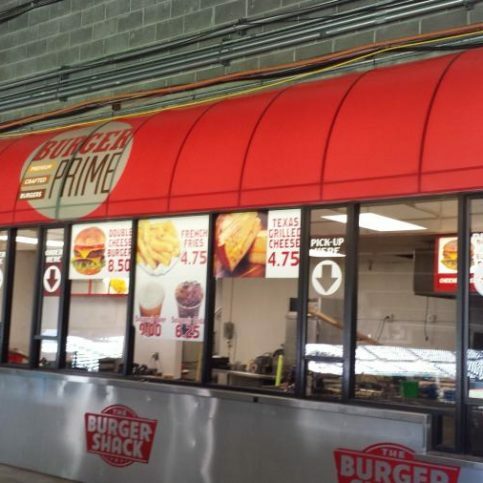 Acme Sunshades Enterprise installed this quarter barrel awning with a backlight at the Oakland Coliseum. 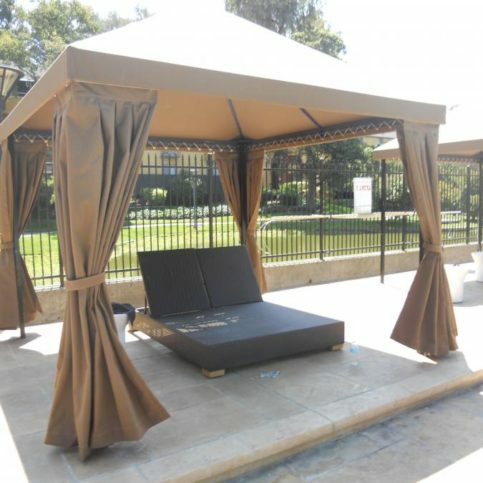 Acme Sunshades Enterprise installed this cabana for a swimming pool in Mountain View. Sun screens with mesh provide soft, filtered light and the ability to see outside without any glare. 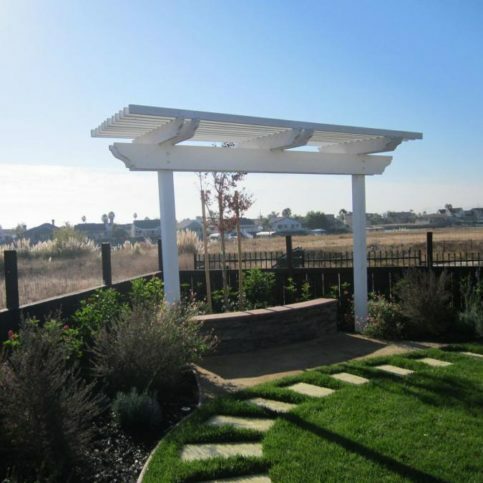 Delta Pacific Builders built this shade trellis over a barbeque in Alamo. This trellis embellishment adds architectural interest to the front of a garage in Alamo. 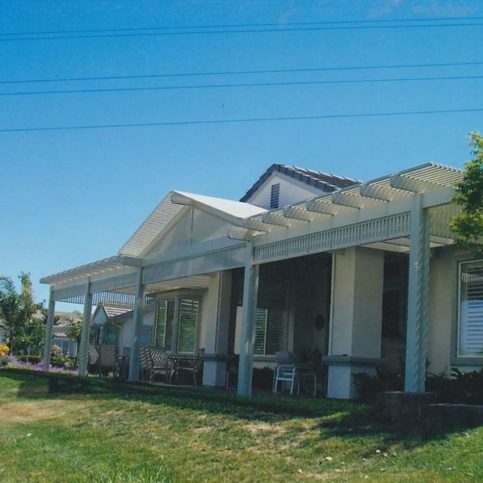 A retractable awning can bring protection, comfort, beauty and style to a home. Acme Sunshades Enterprise installed this pergola with Roman shades on a customerÛªs back patio. 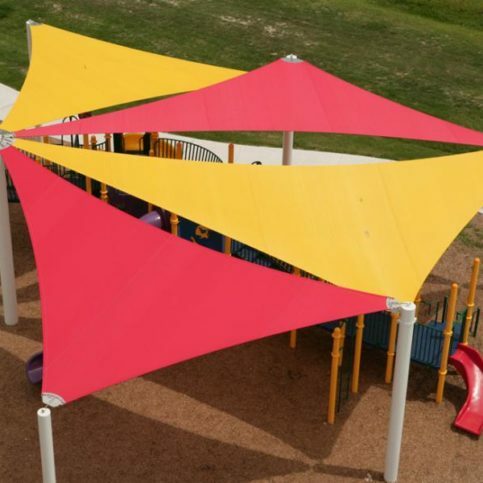 These tensioned shade sails are made with long-lasting fabrics. This outdoor restaurant features retractable pergolas with curved side tracks. 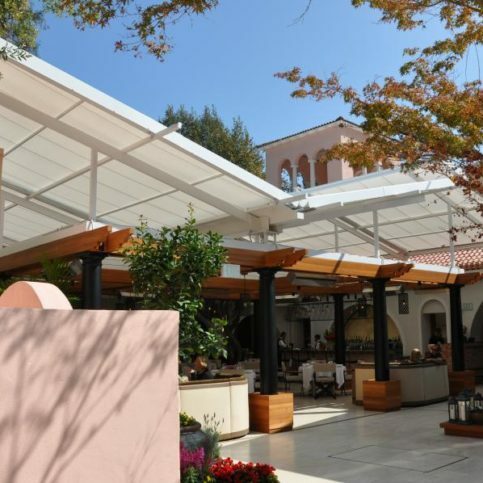 Acme Sunshades Enterprise installed this canopy at Hotel Bel-Air in Los Angeles. Acme Sunshades Enterprise can design fixed frame awnings in different shapes and sizes to fit any home. Delta Pacific Builders built this A-frame patio cover with a gabled roof and lattice cover for a hot tub in Walnut Creek. 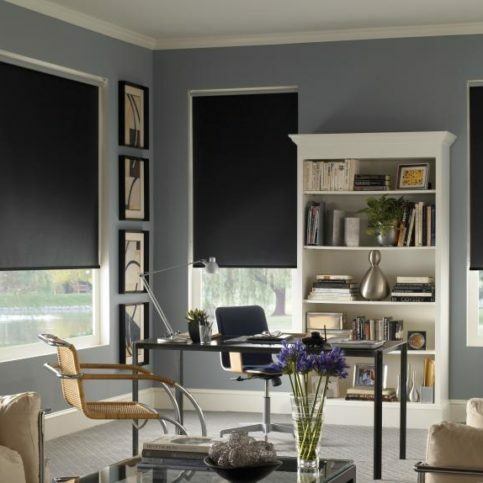 These interior window shades feature mesh covers. This Berkeley restaurant features vertical drop roller curtains and clear vinyl windows. This restaurantÛªs outdoor patio features a retractable pergola with built-in lights and heaters. Acme Sunshades Enterprise installed this standing seam metal awning on a storefront in Hayward. 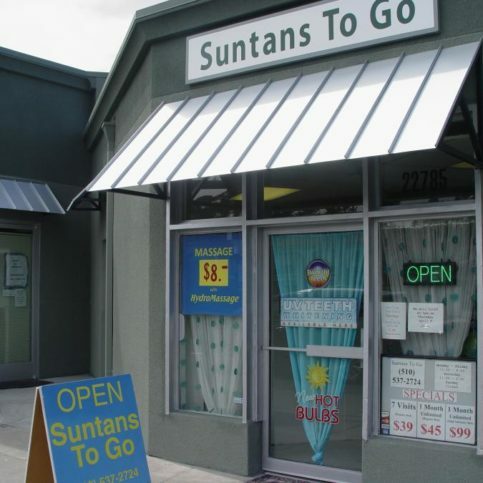 This commercial building features an entry door canopy with graphics. For more information about patio covers and patio cover contractors, see some of the following professional association and agency websites. What Do You Want and Need in a New Patio Covering or Patio Shade? You’ll make better decisions and be more likely to be happy with your new patio covering if you take some time to really consider your wants and needs before heading out to the store or calling local patio covering contractors in Dublin, Newark, Pleasanton, Union City and Alameda and your area. Do I want a Diamond Certified patio covering company that is rated best in quality and backed by the Diamond Certified Performance Guarantee? Where do I need a new patio cover? What do I want from my new patio covering? Do I have specific patio shade covers in mind, or do I want one in a certain color, style, size or that has specific accessories such as lighting or electrical outlets)? Do I want a new permanent patio covering or a movable patio cover? Is quality and value a priority for me? Am I looking for a long-lasting patio cover that comes with a warranty, or do I want a lower-cost option that may only last a year or two? Do I need my new patio covering installed, or am I comfortable with a DIY patio cover system from a local patio covering company? What personal and professional characteristics am I looking for in a local Alameda County patio cover store or installer? You have some basic information about the patio covering that is best for your home, as well as which local patio cover stores and companies can provide the models, materials, services and quality you want. 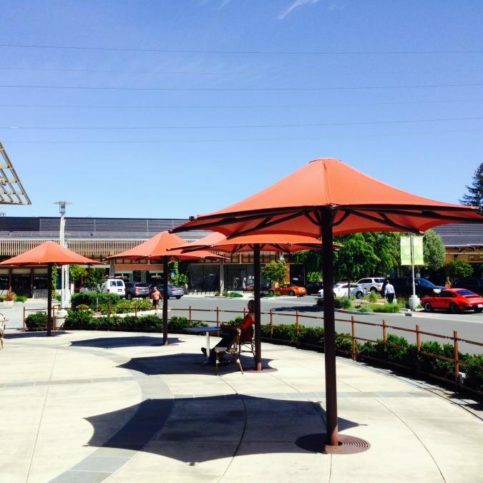 Now is the time to ask some more in-depth questions of the Alameda County patio covering companies that seemed most able to meet your needs and narrow your list further. The following questions, along with some specific ones you add, will give you the answers you need to make a smart decision on the best patio covering company for your job. You may want to invite the three best choices to your home to see your space, the existing patio cover (if you have one), and give you an estimate that takes into account the specifics of your job. This is especially important if you are hiring a patio cover contractor in Pleasanton, Berkeley, Union City, San Leandro and Alameda or another area that will construct a custom patio cover, or if you are ordering a patio covering that requires very particular measurements and installation. Which material is best for my space? Do you have a recommendation for color or size? If I am thinking of buying a pre-made patio covering set or system, will I need to special order the one I want, or is it available to take home right away from your Alameda County patio covering store? Will you or someone else need to install the patio cover I am interested in, or is this a job I can do myself? Can I get a patio cover that meets the special needs of my space (this may include more shade in summer than in winter, protects from rain as well as sun, or other specifics to the site or usage needs)? Will you give me an itemized estimate that includes line-item amounts for materials and labor? What special maintenance or upkeep will I have to perform on the patio shades I’m considering? Do you offer written warranties on your patio coverings? How would I handle future service issues? Are you responsible for warranty work if there’s ever a problem with my new patio cover or the installation? It’s best to choose local Diamond Certified patio cover companies because all certified companies have passed an in-depth ratings process that most other companies can’t pass. If you want quality from patio shade cover contractors in Alameda County and the greater Bay Area, you will have more confidence when choosing a Diamond Certified company. Diamond Certified reports are available online for all certified companies. And you’ll never be fooled by fake reviews, since all research is performed in live telephone interviews of actual customers. If you can’t find a Diamond Certified patio cover contractor within reach, you’ll have to do some research on your own. It’s wise to call references provided by your Alameda County patio cover company. You should know that references provided to you by patio covering services are not equal in value to the large random sample of customers surveyed during the Diamond Certified ratings process. That’s because references given to customers from companies are usually carefully chosen instead of randomly selected from the company’s entire customer database, leaving you with a list of only satisfied customers. Then, call each of the references and ask them questions about their patio cover project and the company they hired. 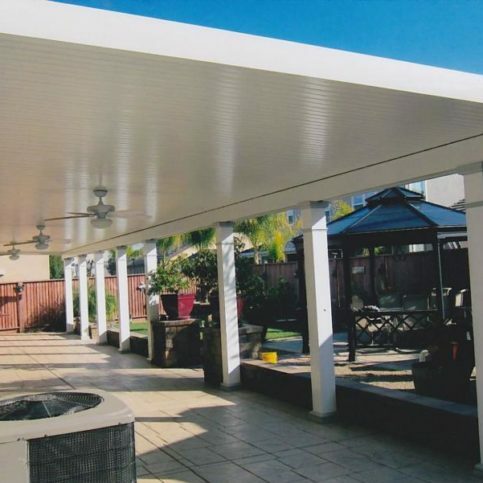 Most will be glad to give you more information about the company in question, which will help you make a more informed choice when hiring Alameda County patio cover services in Oakland, Fremont, Hayward, Berkeley, San Leandro, Alameda, Union City, Pleasanton, Newark and Dublin and beyond. A list of sample questions you may want to ask is below. 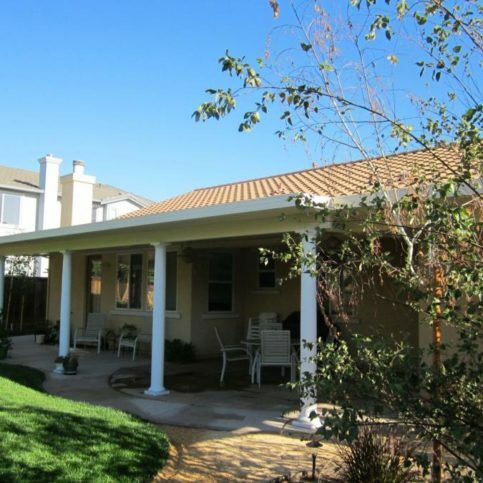 Were you satisfied with the new patio cover and the service you received from this Alameda County patio covering company? Was the staff at the patio shade covering store able to suggest the best type of patio covers for your needs? What was the type and scope of job they did for you (backyard patio cover installation, custom patio cover construction, new metal patio covering, wood patio cover, pergola construction, cloth patio cover or patio shade sail, vinyl patio cover, aluminum patio covering, temporary or movable patio cover, permanent patio covering, etc.)? Did the patio covering store have the items you wanted in stock? If you had to special order them, did they arrive when promised? Did the patio shade contractor keep you informed of the status of the patio cover you’d ordered or were having built? Or did you have to ask them for regular updates? If you hired the Alameda County patio shade cover contractors to install your new patio covers, did they complete the work on time and as promised? Were there unexpected costs? What were they for and were they avoidable? 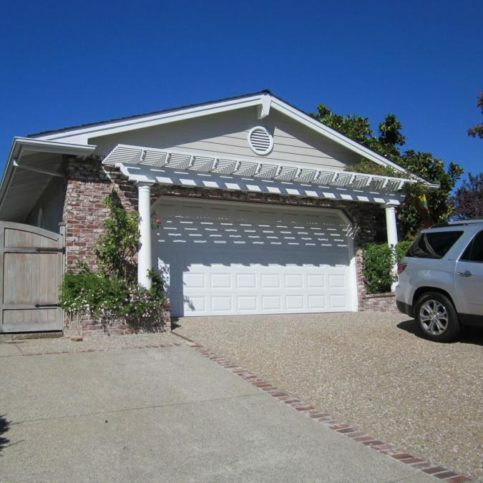 If you live in a smaller town or Castro Valley, Cherryland, Emeryville, Komandorski Village, Piedmont, Russell City, San Lorenzo, Sunol, Livermore, did the patio cover company charge extra to travel to your home? Was this company responsive to your needs? Did they work to give you patio cover options that stayed within your budget? 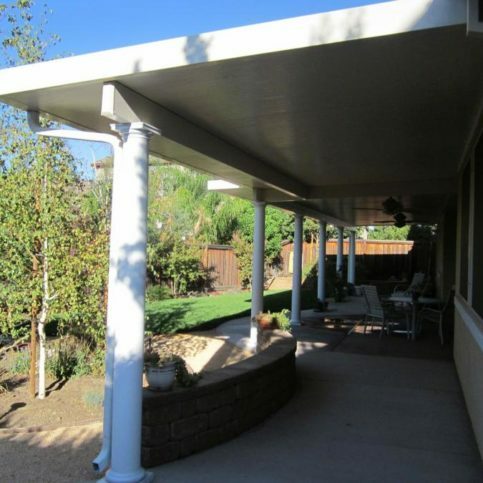 Do you feel that this Alameda County patio cover company offered high-quality products for a fair price? 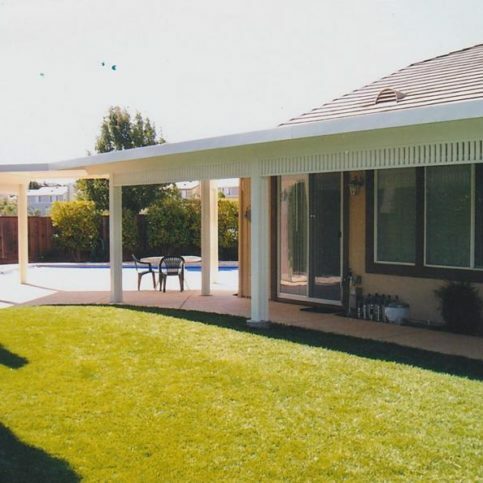 What was the best part about working with this Alameda County patio covering company? Was there anything you didn’t like about this company? If you need new patio covers in the future, would you hire this company again? Would you recommend this patio cover service to your friends or family? Before deciding on the best patio cover companies in Alameda County for you, it’s important to review the notes you took during your interviews and consider the following questions. 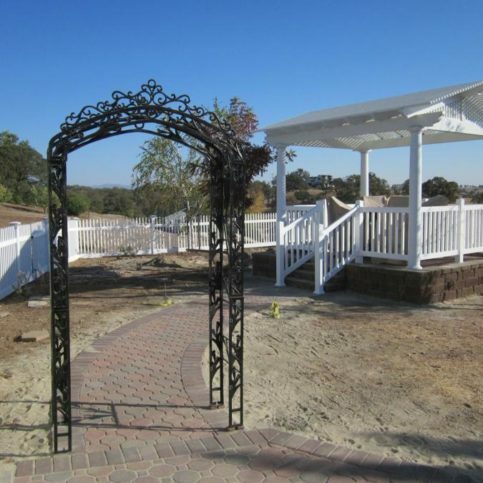 This will give you a final look at each of the Alameda County patio covering services you are considering and allow you to choose the one that best fits your needs and expectations. Can the patio covering companies in Alameda County meet your needs in terms of the type of patio cover, materials, installation preferences, value and quality, and services? Are the Alameda County patio covering stores and contractors knowledgeable about the best type of patio cover for your needs? Can they explain why they’ve recommended certain brands, materials, construction methods or types of patio shades to you? Is the patio covering company sensitive to your budget? Can they recommend various solutions, materials, construction methods and services that match your resources? Are the patio shades and patio covers covered by written warranties and guarantees that protect your investment? Getting a good value from a local patio covering company starts with careful research. Learn the basic information about patio covers, such as the difference between materials, types available and construction methods. Research the pros and cons of each kind you are considering, and discover more about the benefits of each type of patio covering. Learn about patio cover installation methods and think about which will be a better fit for your space and needs. 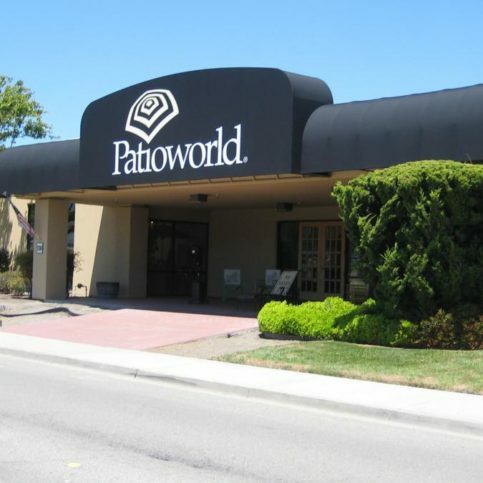 Once you know what you’re looking for and the differences between your options, you’ll be better equipped to talk with the staff at Alameda County patio shade cover companies, including those in San Leandro, Berkeley, Hayward, Fremont and Oakland and other areas. Having a list of your needs and wants will also give you boundaries so that you don’t end up with products, materials, installation services or other things you don’t need or want. Researching your needs and the patio covers available to you will also give you a better idea of whether you can install the new patio shades yourself, or if you need Alameda County patio covering installers to do the job for you. DIY patio covering sets come with all of the materials needed for installation and detailed instructions that may be a good option for handy homeowners, or those who have some DIY experience. However, custom patio coverings such as pergolas, solid structures or other detailed installations may require an experienced patio covering installer to do the job right. As with any contractor you hire, you’ll want to be sure these patio shade covering installers are licensed, insured and have references who can vouch for their work record and customer service skills. 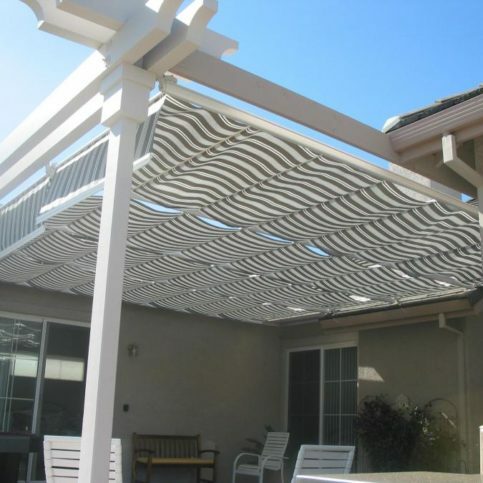 Once you’ve found the Alameda County patio cover company in Oakland, Dublin, Fremont, Newark and Hayward, Mount Eden, Albany, Emeryville, Cherryland, Ashland or another area that you want to hire, order the patio cover you need, purchase it at the patio covering store, or sign a contract for custom patio covering services. Some companies may ask you to sign an estimate and contract, others will only require you to come in and buy the patio cover you want. Use common sense when making this decision; you won’t need a lot of paperwork for simple purchases, but you should insist on a contract or other written documentation if you’re ordering a custom patio shade or having one built to your specifications. As with all legal documents, both you and your patio covering company representative should sign the contract. Contracts are binding, so be sure you completely understand the terms and agree to all items stated in the contract. Never sign a blank or incomplete estimate or contract, as you will be held responsible for all terms you’ve agreed to, even if you didn’t understand them or didn’t read them carefully. Keep children, pets and others out of the work area. For everyone’s safety, keep pets and all people not directly involved with the work away from the area where the new patio cover is being installed. Move unneeded items away from the work space. Whether you are installing your new patio cover or having professionals do it, clear the space where the work will take place. Move deck chairs, patio sets, tables, outdoor umbrellas, barbeques, window boxes, potted plants, decorations, and other movable objects to prevent accidents or injuries. If you have solid, permanent fixtures that can’t be moved, you may want to cover them or try to protect them from damage that may occur if they are hit or have patio covering installation items accidentally dropped on them. Provide storage space if needed. You may need to store your new patio cover or patio shade construction and installation materials before or during the work. 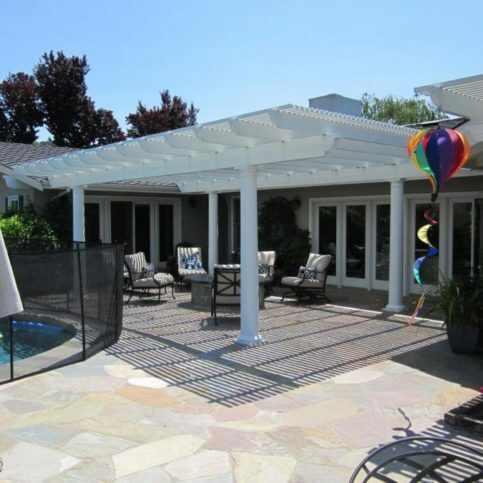 Ask your Alameda County patio cover installation company if you’ll need to make space for materials and, if so, how much room and for how long. Make room for work trucks. Some patio cover contractors in Alameda County, including those serving Dublin, Newark, Pleasanton, Union City and Alameda, Sunol, San Lorenzo, Russell City, Piedmont, Livermore, Komandorski Village, Castro Valley and other areas may drive large work trucks. These vehicles may require more parking space and more clearance than passenger vehicles. 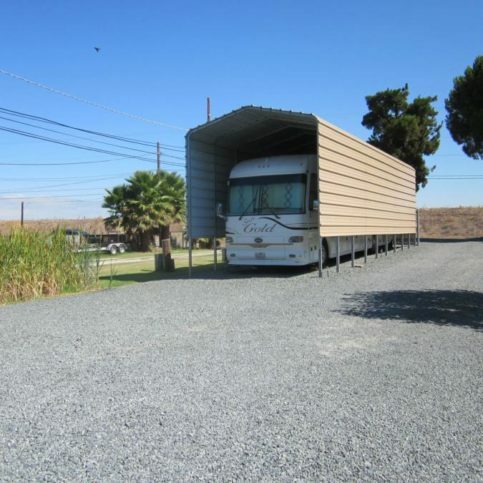 Talk with your Alameda County patio cover contractor and ask them if you’ll need to make room for oversized vehicles. If you are worried about the ability of oversized vehicles to fit into your small backyard or down tight driveways, you may want to ask your patio covering contractor to walk through the work site with you to identify any clearance or parking issues before the work is scheduled to begin. Why Should You Try To Be a Good Patio Cover Contractor Customer? You have a lot to gain by being a good customer when dealing with local companies. Patio cover stores and patio shade installers in Alameda County appreciate customers who are straightforward, honest and easy to work with. Your good customer behavior sets the tone from your end and creates an environment conducive to a good relationship. The new patio cover installation may very well go smoother and any problems you experience during the purchase or installation process may be more easily resolved because of the positive working relationship you’ve built with your patio cover company. It’s the patio cover company’s responsibility to help you choose the right patio covering for your needs and to give you a great patio cover using the best possible materials and installation techniques. But you play a big part in the final outcome, too. Here are a few simple steps you can take to be a good customer when hiring Alameda County patio cover installers in Pleasanton, Berkeley, Union City, San Leandro and Alameda and other areas. 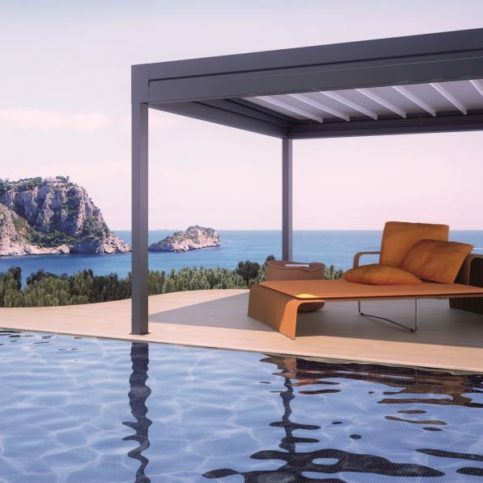 Be clear and upfront with the patio cover companies. Let them know what you want from your patio cover companies, the long-term outcome you’re expecting and specific ways they can satisfy your expectations. A friendly smile and positive attitude goes a long way in creating and maintaining a good working relationship. 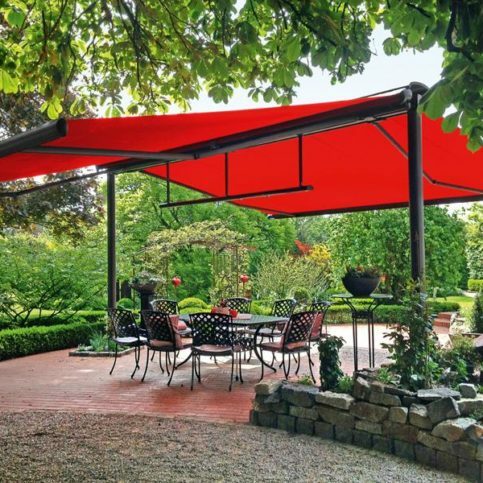 Before you hire a patio shade cover service in Alameda County, restate your expectations, goals, and your understanding of the agreement. Most problems with local patio cover companies occur because of a breakdown in communication. You will avoid most conflicts and misunderstandings by being clear about your expectations and needs. Ask your patio cover contractor if you should call to check on the progress or if they will call you with updates. Be sure your contractor has a phone number where they can reach you at all times while the patio cover order is in place and the installation services are ongoing. The work will move along more smoothly if your patio shade contractor can reach you with updates and questions. Return calls and emails from your patio cover company promptly to help keep the work on schedule. Pay for the new patio cover and installation services on time. The patio cover contractor’s name, physical address and state license number. A complete list of all installation work performed. An itemized list of all materials used or purchased for your job, including patio cover sets and systems. The total cost for the patio cover companies services, with a separate and itemized amounts for labor and materials. Look over the invoice and compare it to the actual job or patio cover system you’ve purchased. Ensure that you’ve received all promised items and work, and that everything you agreed to in the original estimate or contract has been provided as expected. Now is the time to ask for clarification on any missing items, discrepancies, or products or services that are not what you expected or do not match up with your invoice or original contract. Whether you’ve hired a patio covering service in Oakland, Fremont, Hayward, Berkeley, San Leandro, Alameda, Union City, Pleasanton, Newark and Dublin or another area, you may be entitled to guarantees that cover the materials and warranties on the workmanship or patio cover installation. Talk with your contractor or patio cover store about the specific products you’ve purchased and the installation services you’ve contracted for, and ask for written proof of any warranties or guarantees that cover your purchase. Remember, if you hire a Diamond Certified patio cover contractor from Alameda County or the rest of the Greater Bay Area, you may be protected by the Diamond Certified Performance Guarantee. If you’ve hired another company, you won’t have such protections. The Alameda County patio cover companies contractor’s name, physical address and state license number. Homes and commercial buildings with patio areas often require sun shades to protect against sun and light rain. This can make patios and open areas more accessible and more comfortable year-round. There are many choices of patio covers available, from wood and metal to adjustable and louvered designs to serve any need. The following patio cover types are those most popular in Alameda County and across the Bay Area. Most local patio cover companies can provide a wide variety of patio shade options that will fit different locations, needs and budgets. Read through the types of patio coverings below and then use that information when talking with local companies in Dublin, Newark, Pleasanton, Union City and Alameda and your city about the patio shade options that are best for you. A covering stretched or attached across the top of a patio space to block sun and to keep the patio area cooler. Patio covers are also sometimes used to protect areas from light rains, making patios usable even on less-than-perfect days. Patio covers and shade covers can also provide shade and protection for vehicles. Patio covers may be made of wood, metal, vinyl, canvas or other fabric, and may be temporary, movable, retractable or permanently affixed. Adjustable patio covers are those that can be moved, opened, retracted, stretched or otherwise adjusted to provide shade and protection in different areas. They may be permanently affixed with a flexible shade cover or they may be fully movable with bases that can be placed anywhere on the patio for truly adjustable cover. Louvers, or slats, can be a popular choice for patio covers because they allow some sun to filter through while still providing a high degree of sun protection. Louvered patio covers may have fixed louvers or louvers that can be moved to provide different degrees of shade. 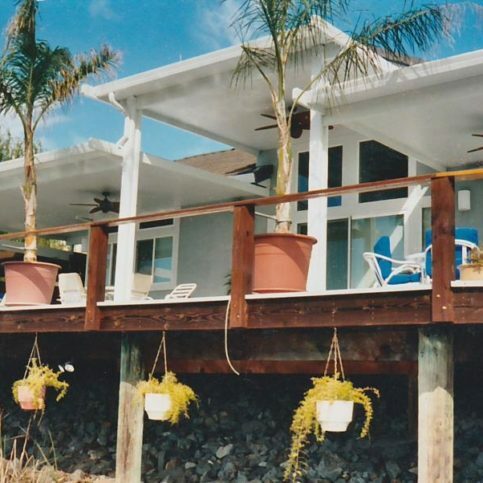 Pergolas are permanent structures, usually made out of wood, aluminum or vinyl faux wood. Pergolas are usually freestanding and anchored to the ground with thick posts that support a patio cover top made of a few cross-wise beams and many long-wise beams that are slotted to allow for some sin to get through while still providing ample shade and protection. They may be covered with ivy, wisteria or other climbing plants for visual appeal and even more protection from the sun. Retractable patio covers that can be manually or mechanically retracted, rolled or collapsed. Retractable patio awnings are popular over patios and yards where coverage is only wanted during peak sun hours to shade patios from heat and sun. Patio covers with canvas shade covers are known as canvas patio covers. These may be temporary or permanent bases with canvas sails, umbrellas, rollout shades or awnings that block the sun and light rain using canvas or another tightly-woven shade cloth. Metal patio covers are made of several types of metal, including aluminum, steel and corrugated metal. Metal patio covers are easy to assemble and relatively simple to install. They are a favorite of customers because of the variety of colors, sizes and styles in which they are available. Metal patio covers are hardy, durable and resist harsh outdoor conditions and insect activity that can deteriorate other materials. Any patio cover built for or useful in a commercial patio setting can be considered a commercial patio cover. These may be rollable patio covers that affix to the sides of buildings, metal commercial patio covers or permanent pergola patio covers that provide visual appeal and shade. 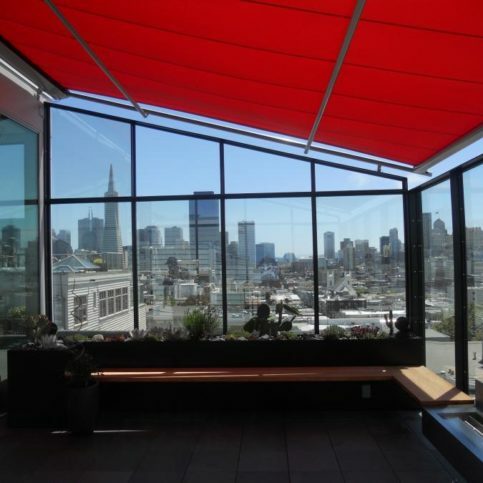 Commercial patio covers are often found at restaurants and cafes, public building courtyards, schools and daycare centers, stores and shopping malls, civic buildings and other commercial locations in San Leandro, Berkeley, Hayward, Fremont and Oakland and beyond that need shelter for patrons. Lattice patio covers are those made of wood or metal strops that are equally spaced to allow for filtered sunlight to pass through only certain areas. Wood patio covers are popular types of patio coverings because they are inexpensive, attractive and can be painted or stained to match the outdoor environment. Wood from maple, cedar, bamboo, and other choices give customers freedom, as do the number of possible designs, including lattice patio coverings, pergola patio covers, and more. 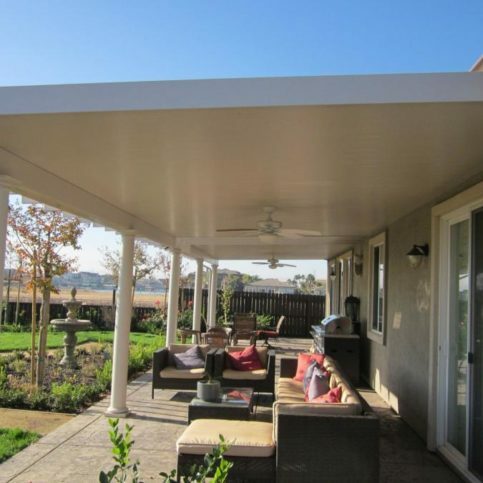 Many local Alameda County patio cover contractors in Oakland, Dublin, Fremont, Newark and Hayward and other areas provide custom-made patio coverings. However, there are several well-known brands that consumers throughout the area rely on for quality patio cover options. Those below are some of the more popular choices. The following glossary will provide more information about the terms and types of patio covers installed throughout the Bay Area. This information may help you better communicate with your patio cover company and ensure that you’re both speaking the same language. A patio covering that is attached to the home, business or building next to the patio that needs covering. Attached patio covers usually affix to the home or building at the exterior wall, roof or eaves. These patio coverings may require special engineering services or special attachment devices to prevent damage to the solid home structure. 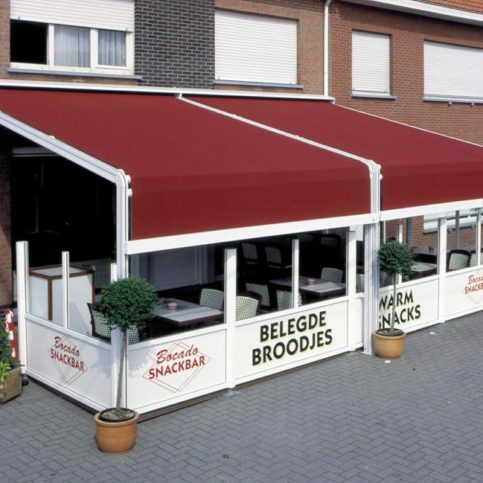 Awnings are used for decoration, business name advertising, and protection from the elements. Most awnings are made of a light aluminum supports covered with fabric or acrylic-coated fabric sheets to shelter patios from sun and rain. 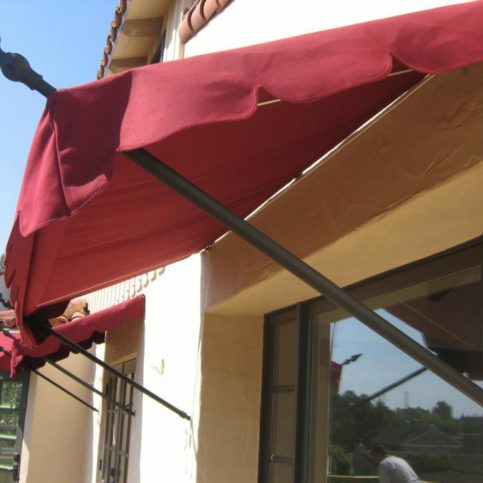 Awnings may be permanently affixed, stand-alone, removable, manually-retractable, automatically retractable or motorized. 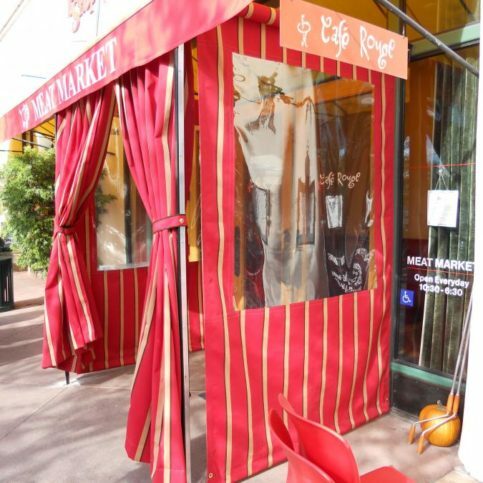 Canopies are fabric-covered structures that are used as patio coverings to provide protection from the elements, decoration or business identification. 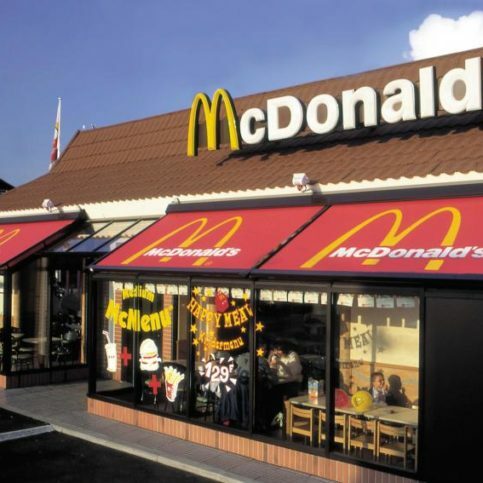 Canopies are usually free-standing or may be attached to a building on one side and to support posts on the other side. Any patio cover built for or useful in a commercial patio setting can be considered a commercial patio cover. These may be rollable patio covers that affix to the sides of buildings, metal commercial patio covers or permanent pergola patio covers that provide visual appeal and shade. 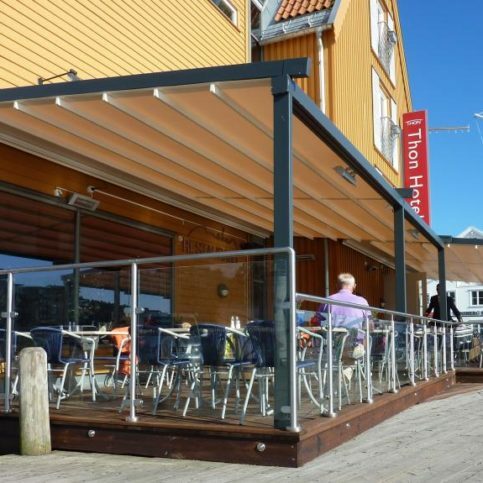 Commercial patio covers are often found at restaurants and cafes, public building courtyards, schools and daycare centers, stores and shopping malls, civic buildings and other commercial locations that need shelter for patrons. 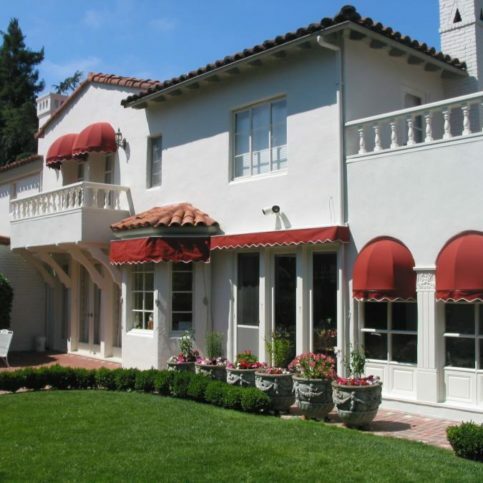 Most patio cover awnings attach to and are supported by a home, building or other structure. Freestanding patio awning covers do exist. These are supported by posts poured into concrete footings or heavy moveable bases. Lattice patio covers are those made of wood or metal strips that are equally spaced to allow for filtered sunlight to pass through only certain areas. A covering stretched or attached across the top of a patio space to block sun and to keep the patio area cooler. Patio covers are also sometimes used to protect areas from light rains, making patios usable even on less-than-perfect days. Some people use patio covers and shade covers to provide shade and protection for vehicles such as cars, boats and motorcycles. Patio covers may be made of wood, metal, vinyl, canvas or other fabric, and may be temporary, movable, retractable or permanently affixed. Pergolas are popular patio cover options. They are permanent structures, usually made out of wood, aluminum or vinyl faux wood. Pergolas are usually freestanding and anchored to the ground with thick posts that support a patio cover top made of a few cross-wise beams and many long-wise beams that are slotted to allow for some sin to get through while still providing ample shade and protection. Pergolas may be covered with ivy, wisteria or other climbing plants for visual appeal and even more protection from the sun. Solid patio covers are made of a solid piece of wood, metal, fabric or other material that completely blocks the sun from coming through the patio cover. This provides complete shade in the area under the solid patio cover. Vinyl patio covers are plastic installations that can be made to look similar to wood. However, they require less maintenance and can last much longer than wood structures. They are also popular because they are usually less expensive than metal patio covers and have a similar life span. Vinyl patio covers are usually easy to assemble and affordable. Recycled vinyl patio covers are also available for customers who are eco-conscious. The amount of wind (usually measured in wind speed) that a patio covering can withstand without collapsing or becoming damaged. Q: Why choose Diamond Certified patio cover companies for your new patio cover installation? A: Diamond Certified helps you confidently choose among local patio cover companies by offering a list of top-rated local companies that have passed the country’s most in-depth rating process. Only patio cover contractors rated Highest in Quality earn the prestigious Diamond Certified award. Most companies can’t pass the ratings. American Ratings Corporation also monitors Diamond Certified companies with ongoing research and ratings. For added value, your purchase is backed by the Diamond Certified Performance Guarantee. So you’ll feel confident choosing Diamond Certified patio cover companies for your new patio shade cover installation. Q: Am I better off choosing a custom patio cover or a prefabricated patio cover? A: That depends on your budget, ideal materials and the size of the patio you want shaded. Your local patio cover contractor can give you advice as to which is the best choice for you. Prefabricated patio covers can be faster to install and may be less expensive than custom patio covers. 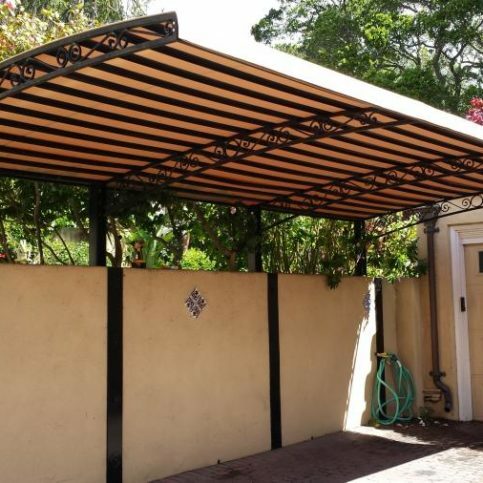 However, if your patio or the area you want shaded is an irregular shape, you have very specific requests for materials and special decorative elements, or you have other customized needs, you may be smart to hire a patio cover contractor who can build a custom patio shade that meets your exact specifications. Q: Will I need a permit before starting my patio cover construction? A: If your patio cover will be a permanent structure or will be affixed to your existing home or business, chances are good that you will need a permit to move forward. However, rules and regulations vary across the Bay Area, so discuss the matter with your patio cover company. Local contractors should be well-versed in local codes, so they’ll be able to give you advice tailored to your location and the project you’re considering. You can also reach out to local building inspectors and ask about regulations in your area. Q: How much do new patio covers cost? A: That is completely dependent on your project. Size, materials, brands, style, decoration and other factors all play into cost, and it’s impossible to give an estimate without knowing all of the components of your new patio cover. Your patio shade cover contractor should be able to show you options to fit your needs and your budget, and they should be able to give you a detailed estimate based on your specifications. You may even be able to save money and get a new patio cover that meets your needs by looking at less expensive modifications or materials that still give you the patio shade you want at a price you can afford. Q: Can I buy a patio cover kit and install it myself? A: That may be a possibility. Many patio cover companies offer DIY patio cover kits that are easily assembled by novice and moderately skilled do-it-yourselfers. This may be an ideal solution for homeowners who want simple patio covers, temporary patio covers or canvas patio covers. However, if you want a very complicated patio covers, custom patio pergolas or you are unsure of your DIY abilities, you may be better off hiring a patio cover contractor to complete the installation for you. Take a look at your needs, wants and options and talk with a local company for advice about whether you can safely attempt a DIY patio cover kit installation yourself. Q: Can patio covers include lighting and electrical hookups? A: Absolutely. Permanent patio covers can be fitted with electrical wiring for overhead light fixtures, mood lighting, fans, lightstrips, electrical outlets and other electrical fixtures. If this is important to you, discuss your options with your patio cover contractor before you choose the patio cover you want to have installed, as electrical wiring in patio covers requires certain building code specifications that may change your options for materials and construction. Q: What colors and materials can I choose for my patio cover? 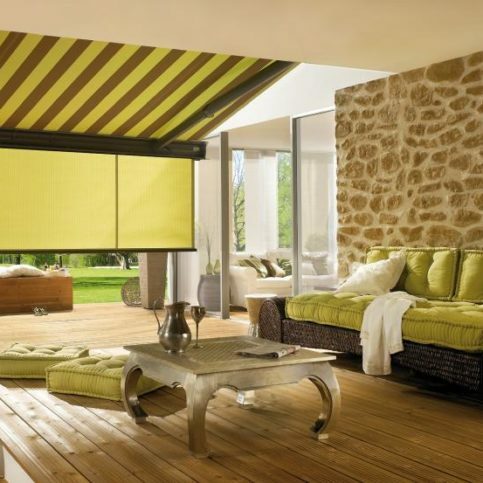 A: Patio covers come in nearly innumerable colors and materials. Wood, aluminum, vinyl, canvas, steel and other natural and manmade materials are available for both the supports and canopy covers of patio shades. As for colors, natural and stained woods offer natural choices, while painted wood, metals and vinyl patio covers are available in hundreds of colors. Fabric patio covers like canvas and oilcloth also offer hundreds of choices. Your limits are only decided by your needs and wants for the patio cover construction materials, as not all colors or materials may offer the same strength, durability or shade requirements. Call a local patio cover contractor for a full description of your color and material choices. Be sure you have a list of your requirements and desires before you call, including the size of patio you want shaded and any other needs that may help narrow down your color and material choices. Q: Can I find patio covers that are fire resistant and meet local fire codes? A: Many patio cover manufacturers create products that meet and exceed local fire code requirements and those of the California Wildland Urban Interface and other fire protection groups. While wood and vinyl patio covers may not provide adequate fire resistance due to their natural properties, many aluminum, metal and even some fabric patio covers are fire resistant. Q: What kind of maintenance or cleaning will my new patio cover require? A: Depending on what your patio cover is made from, you may have little or no maintenance requirements or you may need to provide annual cleaning or more. Most wood patio covers will require a little more maintenance than metal, vinyl or other hardy materials. Wood patio covers might require termite treatments or spraying to keep wood boring bugs away, and they may need to be painted or sealed to keep their appearance. Vinyl and metal patio covers require very little upkeep other than semi-regular cleaning to keep them looking like new. Discuss maintenance and cleaning as part of your conversations with local patio cover companies so you can factor that in with your decision on a new patio shade covering, especially if you are looking for a low- or no-maintenance option. Q: What size patio cover will I need? A: Look at your outdoor space and decide how much shade you want and need. This may include observing your patio every hour during the day and during different seasons to catalog where the sun hits and for how long. Your patio cover contractor may be able to help you perform this research and will be able to suggest the best size for your space both aesthetically and functionally.